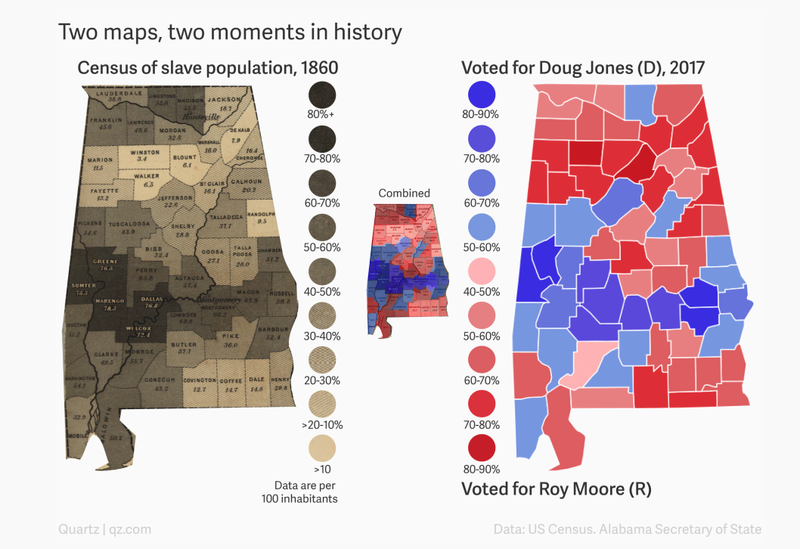 Quartz: Two maps explain the racial history behind Alabama’s senate vote - "This 1860 map from the US Census (pdf)–a beautiful relic of a horrible part of US history–shows the distribution of slavery in the South. It was made to raise money for sick and wounded soldiers of the army. 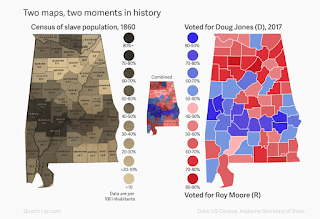 And while correlation is not causation, there is a startling visual parallel when you zoom in to Alabama on the map and compare it to how Alabama just voted this week." Earth Imaging Basics - A video series from DigitalGlobe narrated by Josh Winer. U Chicago News: Hydraulic fracturing decreases infant health, study finds - Infants within two miles of fracking sites are more likely to have low birth weight. WSIL: Murphysboro teachers honored for Trail of Tears curriculum - The new curriculum they created combines GIS mapping and archaeological finds. Worcester Telegram: Experts: Methodology used by Worcester State professors accused of plagiarism is common - Three Worcester State University researchers accused of plagiarism in a voting study by a Doherty High School teacher did not plagiarize according to GIS faculty from Tufts, Salem State and Clark University. A shoutout to the Telegram for staying on the story tracking down experts. Westward: Shame Energy-Inefficient Buildings in Denver With This Map! - The Denver Department of Public Health and Environment has released an interactive map that ranks buildings across the city based on their energy efficiency." I think a graduated color scheme would be appropriate here. I see Skittles! New York Times: The Year From Above - "Major news events in 2017 were big — often big enough to be seen from far above..."
The Origin of Everything (PBS): Why Do We Get Grades in School? - A seven minute video explaining that some professors from Yale and Harvard got us to where we are and some good questions about if we should continue on with grades at all. LinkedIn: Location is rapidly emerging as a critical consumer expectation - Brian Solis of The Altimeter (who I know from FIR podcasts) argues how important location is to marketers. PointerView (West Point): Marchillo, GIS honors major, works Augmented Reality Sand Table - Class of 2018 Cadet Jacob Marchillo, a geospatial information science honors major, is building a sand table using augmented reality tools as part of his capstone project. He's modeling Pointe du Hoc, the 100-foot cliff overlooking the English Channel on the coast of Normandy in France. There's also sand table news from Minnesota this week. The Moussulian: Missoula kids share special places with poetry, map - Fourth graders are writing poems about their favorite local places. Interactive maps with the poems and pictures will be displayed at the Missoula County Public Library and online this April. The project is a partnership between schools and the Missoula Writing Collaborative, Geodata Services, and Chris Robitaille of Xplorer Maps, who will draw a custom background for one of the maps based on the students’ work. 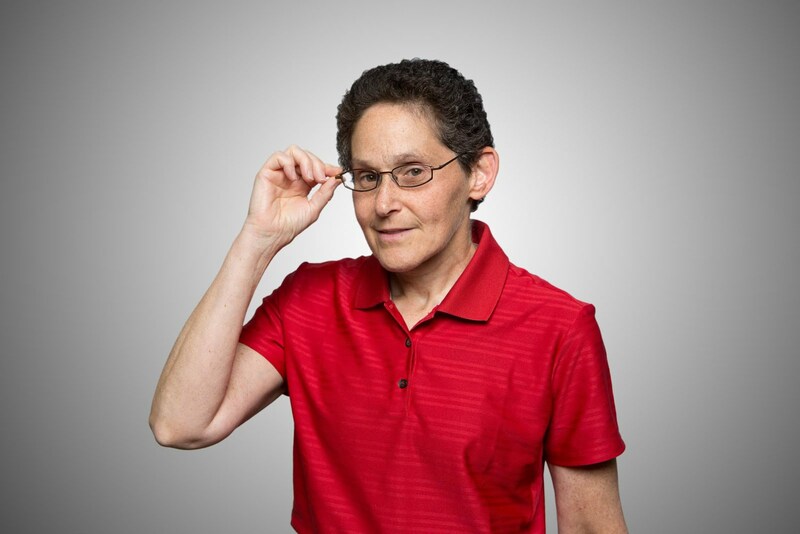 Smith News: A New Kind of Mapping: Professor Introduces Students to GIS - Using Story Maps at Smith College. eSpatially New York: Geospatial Technologies at St. Lawrence University - Sam Wear blogs about GIS at the upstate New York school. Chronicle of Higher Education: Use of Free Textbooks Is Rising, but Barriers Remain - The latest survey reveals, among other things, "the share of faculty members adopting open-licensed textbooks rose from 5 percent in 2015 to 9 percent today." Inside Higher Ed: New Media Consortium Suddenly Folds - The closure is blamed on money management issues. NMC produces The Horizon report on education. DigitalGlobe, with support from Amazon Web Services, has launched GBDX for Sustainability Challenge. The idea is to create interest in the geospatial big data platform, GBDX, and its 100+ petabyte image library. DigitalGlobe is soliciting ideas on how to leverage GBDX to solve real world problems. Judges will select winning teams who will then have two months of access to complete their projects. "Winners of the challenge will be awarded extended access to GBDX to continue to further implement and scale their project. In addition to continued GBDX access, the World Bank will also host the winners at their headquarters in Washington, DC to showcase their project results." Basically, in exchange for finding use cases for the platform, teams get to use the platform. The deadline to submit applications is January 12th. It appears there may be monetary awards for open source posters submitted to the2018 Geospatial Technology Skills Competition. Reminder: Juniors, seniors and grad students from New England and New York colleges have until Jan 8th to apply for the NEGIS Scholarship. I'm on the NEGIS board and would like the see more applicants. Please let your students/friends and other who are eligible know about this free money. If we have worthy candidates, we can give out more than one scholarship! OSGeo offered up tasks involving FOSS4G, GeoServer, GeoTools, GRASS GIS, gvSIG, MapServer, OpenLayers, OSGeo, OSGeoLive, pgRouting, PostGIS, and QGIS. To date, 121 tasks have been completed including the creation of videos showing how to use/install software, T-shirts for coding sprints, and graphics for manual pages. I'm pleased to report this newsletter now has more than 100 e-mail subscribers. That's not bad since I do exactly no marketing. Many other people read GIS Education Weekly on-line. I do have a favor to ask. If you have education GIS news (new courses, new methods, case studies, videos, etc.) please send it on. I'm happy to include your news. I'm going to take next week off, so expect the next issue in 2018. Happy Holidays!